For the Love of Creativity of Allison l Norfleet Bruenger Collections: Week Nineteen Smells Like a "Rose"
Week Nineteen Smells Like a "Rose"
Well I'm back from Detroit and it's time to get back to designing. I have to admit I had a bit of a bus man holiday because while there, of course, I worked on a couple of pieces. This bracelet was one of my favorite so I thought I would feature it for this Week's Challenge. I really liked the color combination of pink / pale rose and copper. I already have 2 orders for this one. It feels like a vintage piece with a little" blush" of color. 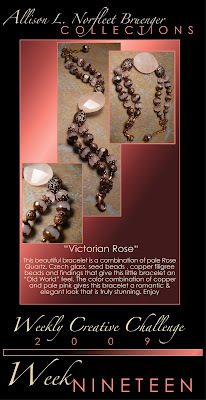 Well I now introduce to you all "Victorian Rose".